Now that Halloween is over, it’s time to fill your stomach with some real food! Lucky for you, National Sandwich day is November 3 and lots of restaurants are offering deals and discounts for you to enjoy. And don’t worry, you can still have your Halloween candy for dessert! Get a free classic roast beef sandwich with any drink purchase when you sign up for the Arby’s newsletter. Head to Capriotti’s on November 3 for a small Bobbie sandwich for just $5. To get this deal, you must have the CAPAddicts Rewards app. For National Sandwich Day, this shop is offering all of its sandwiches for 50% off! This deal is available from 2pm to 6pm at participating locations. 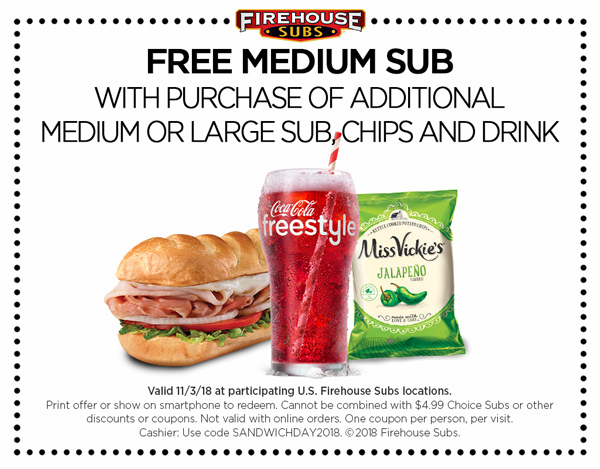 Grab a friend and head to Firehouse Subs on November 3 for a free medium sub with the purchase of a medium or large sub, chips and a drink. To get this deal, show this coupon at checkout. Look out for a $2 off coupon from this sandwich shop on November 3. It will be shared on the Jersey Mike’s Facebook page and sent to email club members. In honor of National Sandwich Day, McAlister’s Deli is offering its signature McAlister’s Club for only $4 which saves you just over $3! Philly’s Best will be offering buy one, get one free cheesesteaks and hoagies from you buy two medium fountain drinks on November 3. To get this deal, show this coupon at participating locations.60 places to get free food via app or email signup! This sandwich shop is offering delicious deals all week long through its Potbelly Perks program. If you’re not already a member, you can sign up here for free. When you join, you’ll earn points with every purchase — plus, you can grab a free sandwich with the purchase of a kids meal on National Sandwich Day! On November 3, Schlotzsky’s Deli is offering buy one, get one free medium sandwiches at participating locations. You can also get a free small classic sandwich when you sign up for Schlotzsky’s Rewards. For every purchase made on the Subway app and Subway.com November 3 through 9, Subway will donate a meal to Feeding America. Also, use Paypal to save $5 on a purchase of $5 or more at Subway with this deal! Head to Quiznos on November 3 to get any 8″ sub for $5. To get this deal, present this coupon at participating locations. RELATED: 60 places to get free food via app or email signup!